JOIN 50,000+ PROFESSIONALS AND SUBSCRIBE TODAY! Looking for a brief weekly update to keep stay in the loop with life sciences industry news? This is the right subscription level for you. In addition to our newsletter, receive our weekly hiring updates and industry-specific news. Join our exclusive list and also gain access to our invaluable white paper, How Well Do You Network? 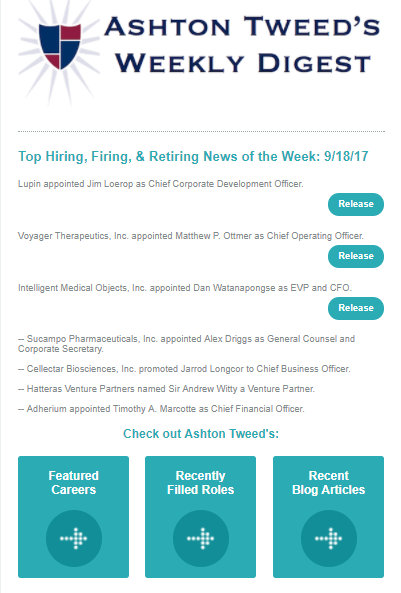 - Top hiring, firing, and retiring news within the life sciences industry. - Featured article and upcoming networking event of the week. - Spotlight on an outstanding candidate of the week. 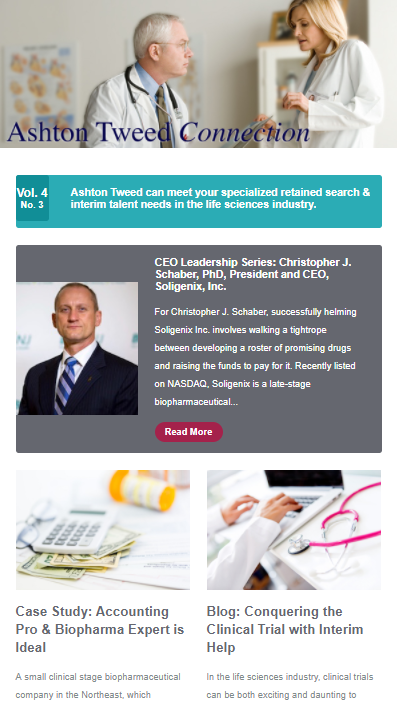 Subscribe to Ashton Tweed Connection, a free email newsletter every six weeks, where Ashton Tweed shares their extensive industry knowledge and networking connections to help you stay attuned with the most relevant news and trends in the life sciences. Subscribe today and also receive our exclusive white paper, How Well Do You Network? – A featured CEO Interview covering hiring and management trends in the life sciences from a local industry leader’s perspective. – Networking tips, career advice, and much more.